This new book will appear beginning 2019. Again, interesting story and lots of drawings and pictures for the modeler. “The naval warfare of the last few decades appears dominated by operations of fast missile craft and a wide diversity of other minor vessels in so-called ‘littoral warfare’. On the contrary, skills and knowledge about anti-submarine warfare on the high seas – a discipline that dominated much of the World War II, and once used to be the reason for existence of large fleets of the North Atlantic Treaty Organisation (NATO) and of the Warsaw Pact – appear nearly extinct. Indeed, it seems that no armed conflicts involving this form of naval warfare have been fought for a significant time. As so often, the reality is entirely different. Submarine and anti-submarine warfare remain one of most sophisticated forms of armed conflicts to this day. Unsurprisingly, considering the amount of high-technology equipment necessary for their conduct, they are shrouded behind a thick veil of secrecy. This is why the operations of the sole Argentinean aircraft carrier – ARA 25 de Mayo – during the much-publicised war in the South Atlantic of 1982 remain largely unknown until this very day. It is well-known that the United Kingdom deployed the largest task force its Royal Navy had assembled since the Korean War over 12,000 kilometres away from home. It is well-known that the operations of this task force proved decisive for the outcome of the war: it not only brought the air power that established itself in control of the air space over the battlefield, but also hauled all the troops and supplies necessary to recover the islands that were the core of the dispute. However, the impression created very early during this conflict – and largely maintained until today – is that ARA 25 de Mayo and other elements of the accompanying Task Force 79 of the Argentinean Navy were forced into a hurried withdrawal by the sheer presence of multiple nuclear attack submarines of the Royal Navy. Based on years of research, including extensive investigation into naval operations of both sides of the conflict, ‘A Carrier at Risk’ is a vibrant and lucid account of a week-long cat-and-mouse game between anti-submarine warfare specialists on board ARA 25 de Mayo, and multiple nuclear attack submarines of the Royal Navy: an entirely unknown, yet crucial aspect of the South Atlantic War. Looks like a thoroughly interesting book, Dirk. Thanks for bringing it to our attention. Could be interesting Dirk – I will be curious to see if there is anything more to know than the consensus that the 25 de Mayo spent most of its time in port. Interesting that the Argentinians only carrier was a WW2 era ex Royal Navy vessel . Here you can find the complete history. Be advised, the Argentinians were operating even the most modern Super Etendard from the carrier deck. They made full use of the old lady. Regards, Dirk. ? The Netherlands. I’m gonna have to read that. Just finished The Battle for the Falklands earlier this year! Hi Greg ! is that a good read ?, I remember the whole event well ,as a teenager it was all over the news and every conversation for months, I remember the Navy leaving port to great pomp and sailing back victorious months later I remember the Vulcan flying that last ever bombing mission and the injured and dead being brought home……I guess we showed the whole world what happens when you trespass in our back yard, a bulldog is only small but if you try and take a bone from him he bites you. The book above is written by journalists. No knowledge about military operations and in some cases even jeopardizing military operations. Books with the most impact. Not mentioned in dispatches. 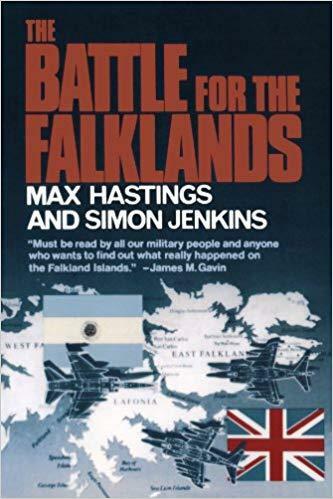 A LtCOL that never should have been in command of a elite fighting battalion (Parachute regiment) Problems starting already during the transit from the UK to the Falklands. If you read this book, you can imagine how difficult it must have been for the second in command. Eventually, after the CO was killed, he had to take over. Beyond HMS Endurance from Captain RN Nick Barker. Still need a model from this famous ship. (very critical). Reasons in writhing by Lt Col Ewen Southby Taylor RM. Very critical and the forecaster of the disaster that happened in Bluff Cove. Also very critical. I did read about thirty books from this conflict. But these are the most rewarding ones. be aware, if you buy, take the pocketbook.